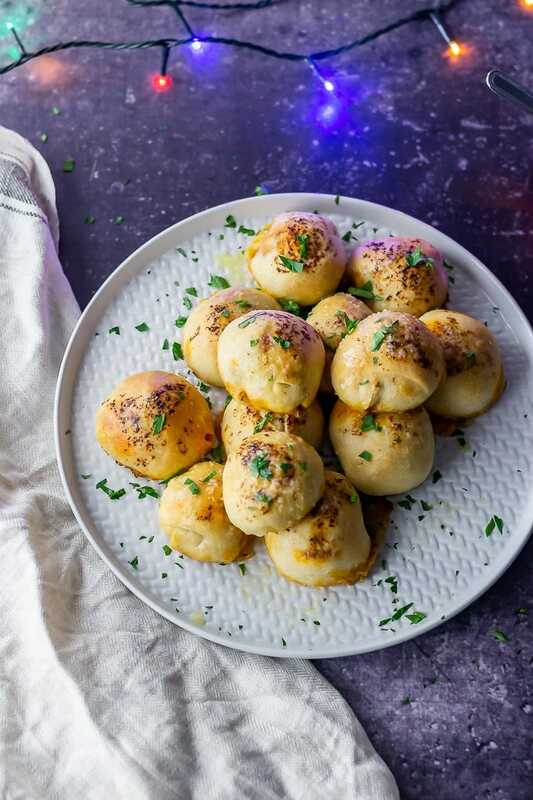 These pesto mozzarella stuffed dough balls make a perfect appetiser or party snack. 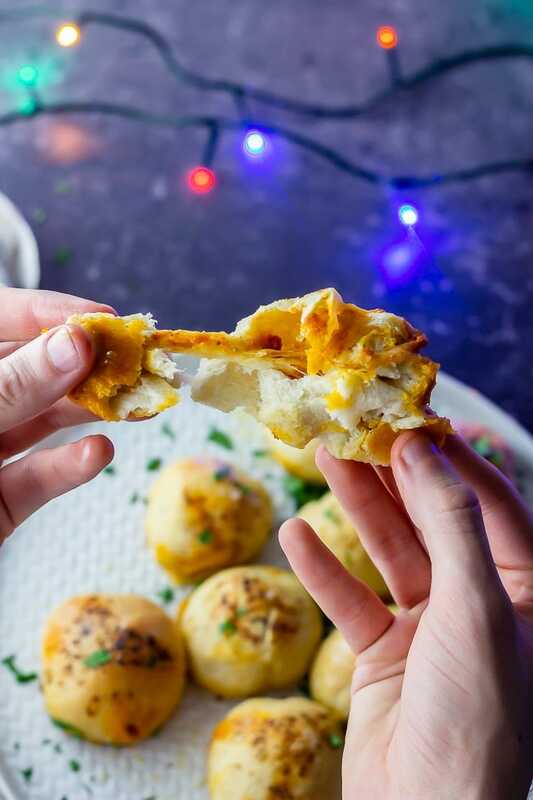 They’re easy to make with pizza dough and taste amazing drizzled with garlic and herb butter! 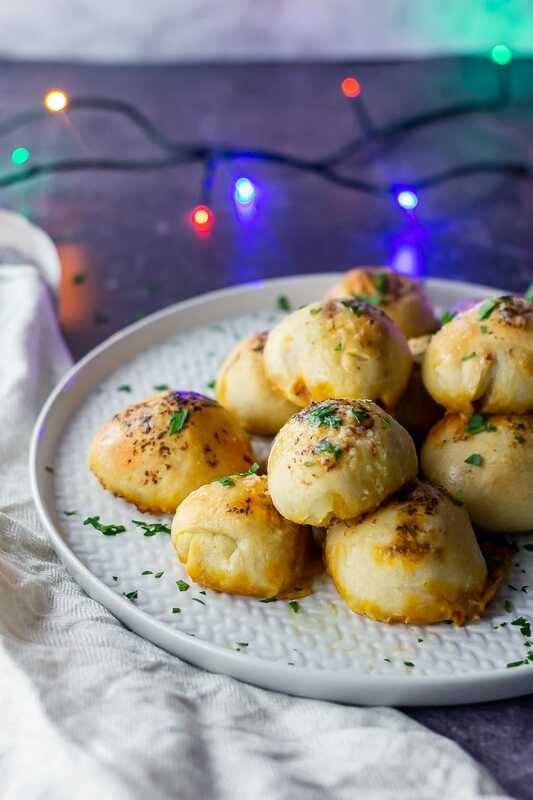 Note: This post was first published in 2016, I have now updated the photos and text to make it even more helpful to you when making these incredible stuffed dough balls! Cheese! 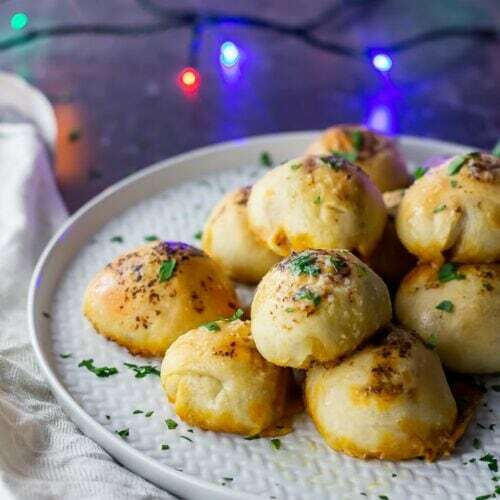 Cheese dough balls! 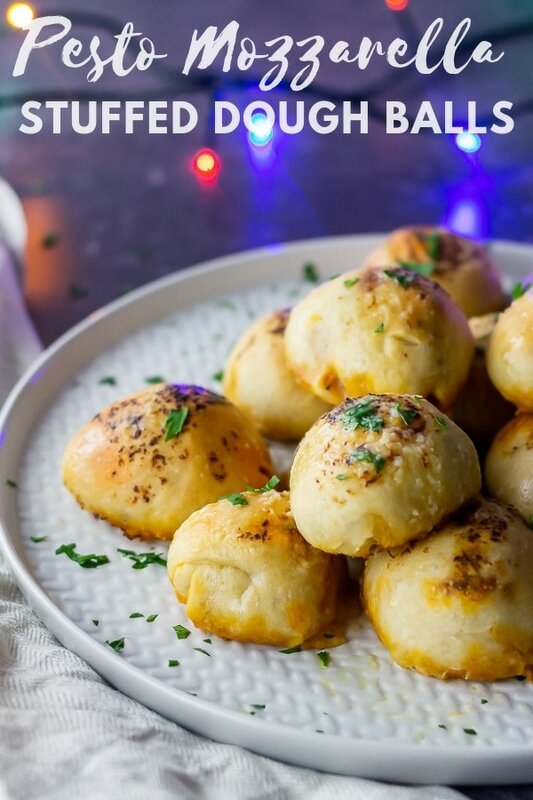 Cheese and garlic dough balls! How else do you like your cheese?! 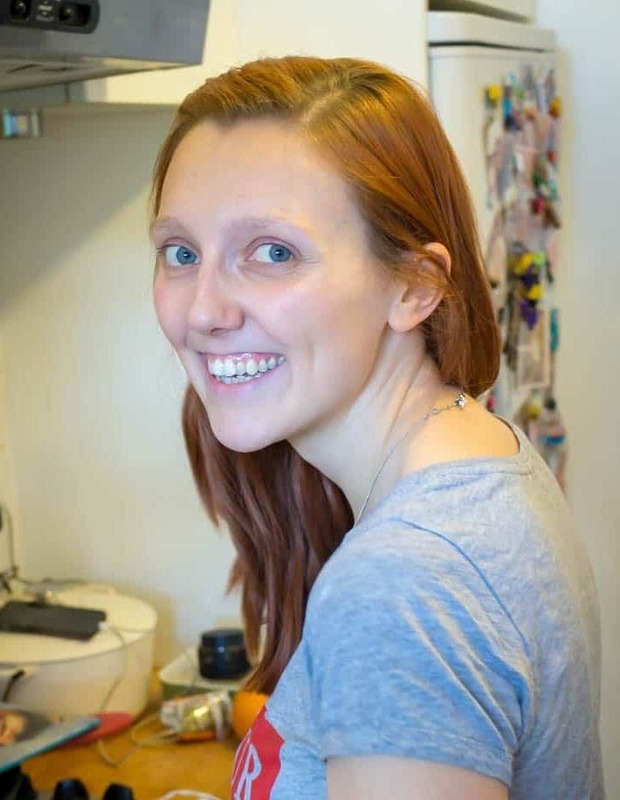 Do you like four of them in a fancy butternut squash lasagne? Or do you like it all melty on a baked gnocchi? Or how about stirred through soup? 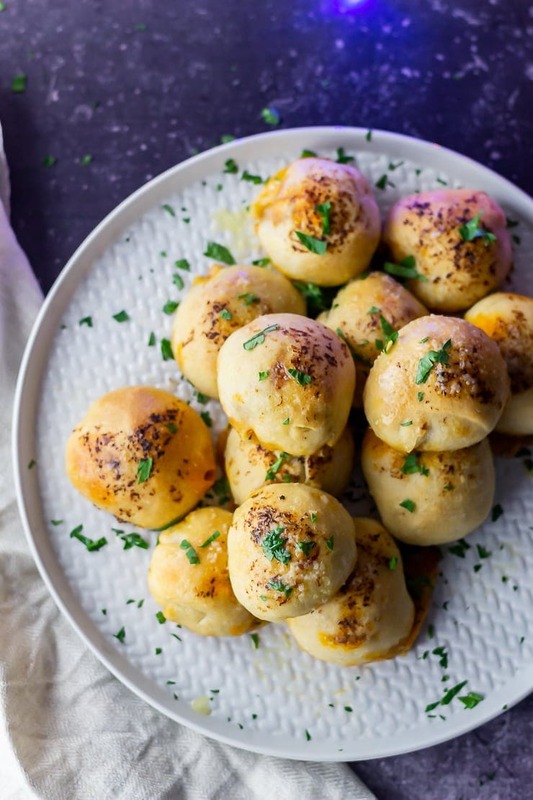 All of those are good but I’d say that one of the most amazing ways to get your cheese hit is stuffed inside something carby and delicious like this recipe for dough balls with mozzarella! Sometimes we just want a whole lot of carbs. Like even more than normal. A Friday night a few weeks ago was one of those occasions. We considered all the usual carb options. Heaping bowls of pasta, massive pizzas with stuffed crust, anything Mexican. Then we remembered we had pizza dough in the freezer and there was pretty much no other option than to make dough balls. Dough balls remind me of going to Pizza Express when I was younger. You UK peeps know the ones? When Pizza Express used to standardly always have a buy one get one free deal on their main courses. Then of course you’d have a whole load of dough balls to kick everything off. So warm and dipped in that garlic butter, yes! But, let’s be honest, those dough balls were lacking a little something in the shape of cheese and pesto. 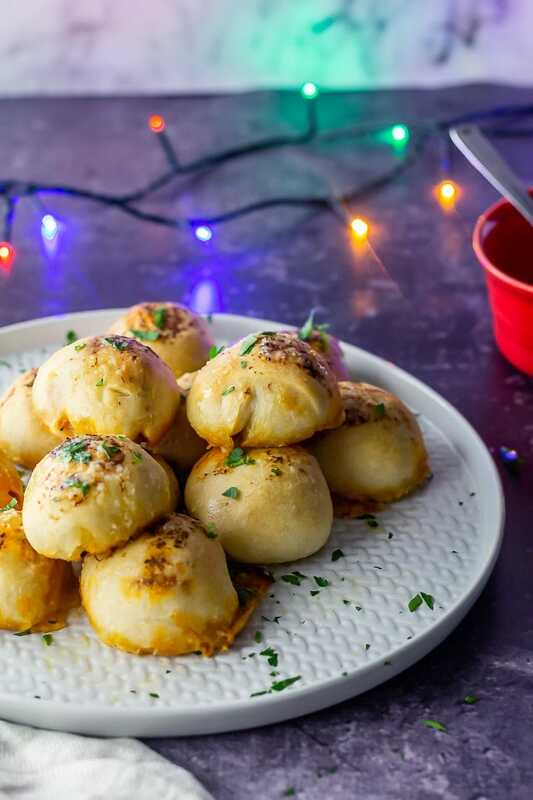 So we decided to fix that by stuffing our dough balls with red pesto and mozzarella. And then smothering them in garlic butter before and after baking. Yes, that’s right, garlic butter. You’re welcome. Can I tell you a secret? We ate these and THEN we ate lasagna. Slightly ridiculous. Will and I are just a terrible influence on each other and, on the whole, I always always think I can eat more than I actually can. It’s an annoying problem which leads to a lot of half eaten plates of food. They can easily be changed according to what you like. Fancy a different type of cheese? Go ahead. Prefer green pesto to red? That will still work! How do you make dough balls? Cut your pizza dough: Heat the oven then cut your pizza dough into 12 equal pieces. Make your dough balls: Flatten each piece of dough and add a spoonful of pesto and a cube of mozzarella to the middle of the circle. Wrap the dough around the pesto and mozzarella and shape into balls. 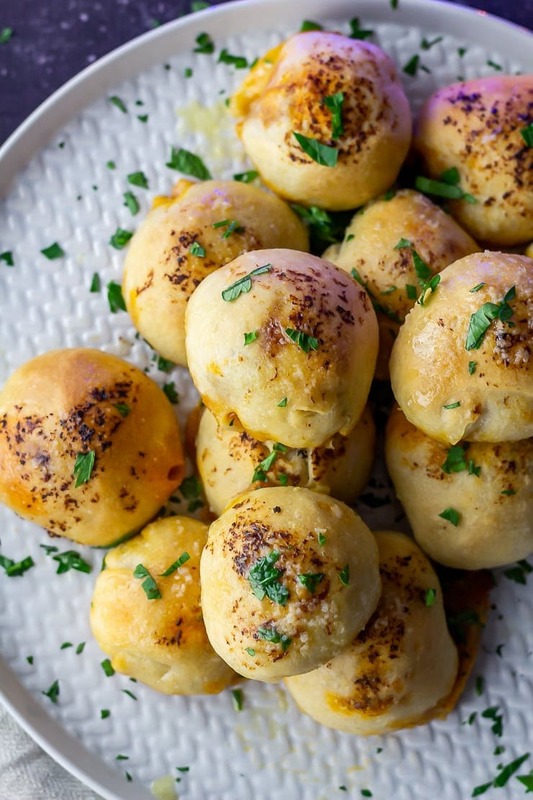 Bake the dough balls: Place each dough ball on a lined baking sheet. Melt half the butter and garlic together and brush the dough balls with the garlic butter. Bake for 20 minutes. Brush with garlic butter and serve: Melt the remaining garlic butter and brush over the baked dough balls before serving. Want more? Try these other recipes using pizza dough! 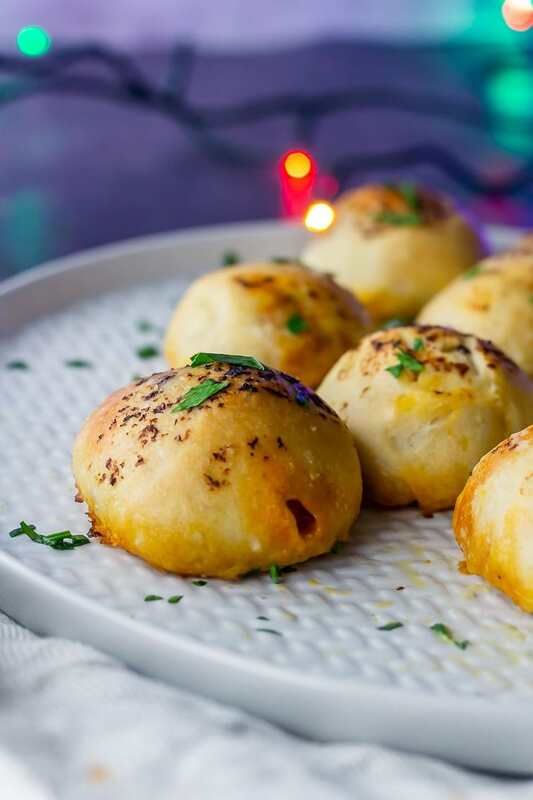 These pesto mozzarella stuffed dough balls make a perfect appetiser or party snack. 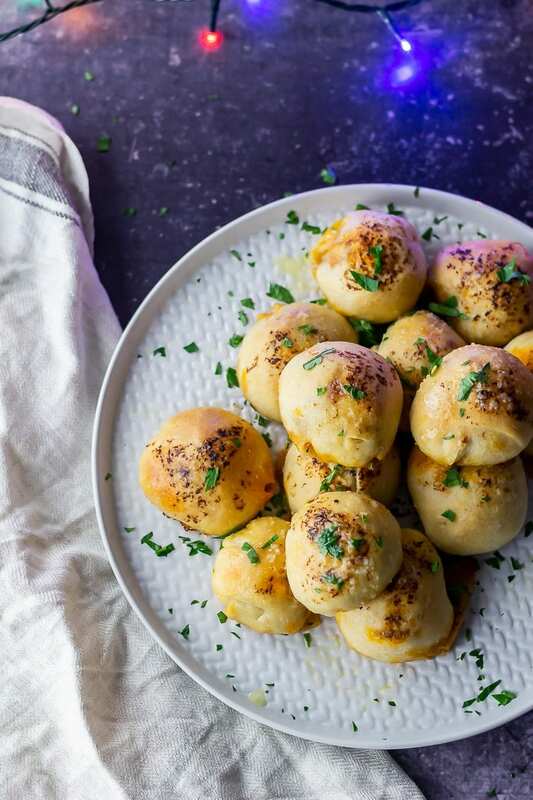 They're easy to make with pizza dough and taste amazing drizzled with garlic and herb butter! Preheat the oven to 200°C (fan oven). Split the pizza dough into 8 balls. Flatten each one and place a little red pesto and a cube of mozzarella in the middle. Fold the dough around it and roll into a ball. Place each dough ball on a baking tray covered in grease proof paper. Mix half the garlic and melted butter together and brush each dough ball with the mixture. Place in the oven for 20 minutes, checking for doneness from 15 minutes onwards. 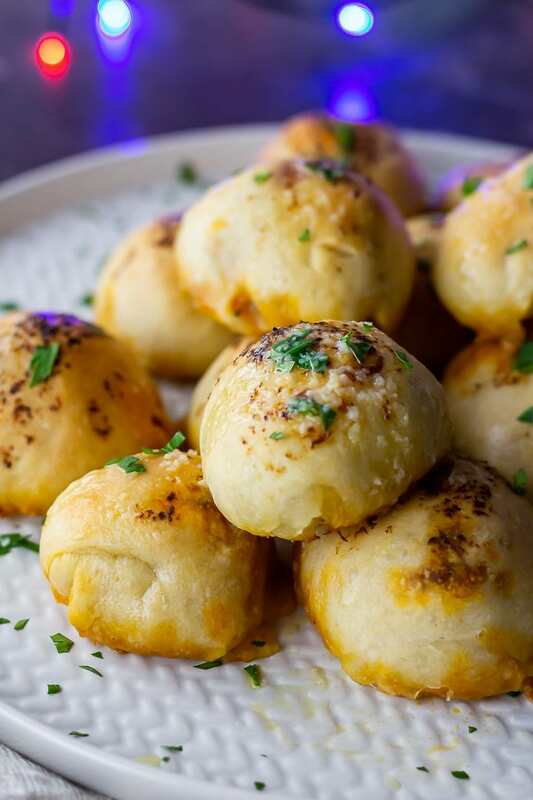 Mix the rest of the butter and garlic with the parsley and drizzle over the dough balls before serving. We used the pizza dough recipe from here and that made the right amount of dough. The nutritional information is per dough ball. OMG, little pizza-y pesto cheese flavor bombs! MUST. HAVE. Pesto is totally my new favorite food but I have not had red pesto, yet! Must do some research on that one! Yum, these look amazing! We are the same way. There are always half eaten plates in the refrigerator that we eat the next day for lunch! Such a great idea to put pesto into yeast rolls. Delicious! I take anything with pesto and mozzarella. 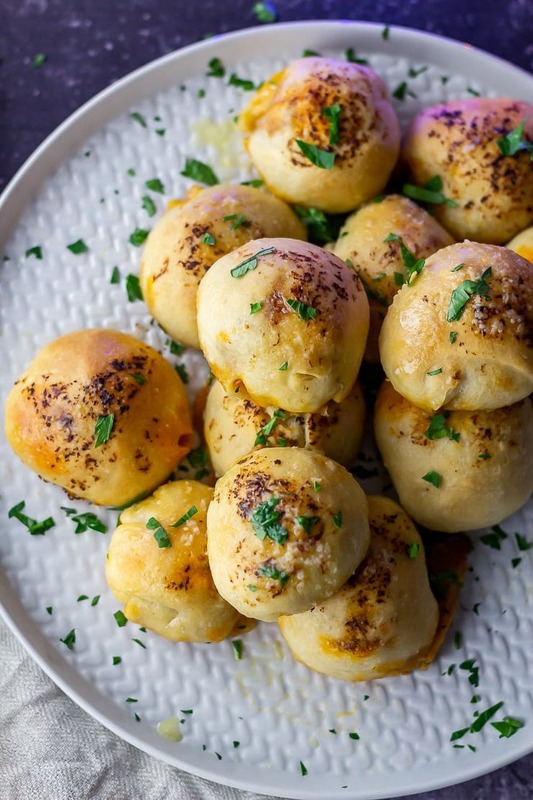 These dough balls look fantastic@!